One of the best discoveries I have ever made is that you can almost always save money making things yourself rather than buying them in the store. When you make your own food from scratch, you are creating more than something to eat, you are creating memories. Doing it yourself also gives you the freedom to mix things up, and make it what you want. This comes very in handy for me. I tend to get my mind set on something very specific, and I can basically never find exactly what I am looking for already made. I’m not just talking about food either. I have had to make my own day planner, party decorations, shorts, baby carrier….all because I am stubborn and I want things exactly how i want them. It’s a good thing I love DIY projects. Mostly, I love cooking. I needed some toffee for a special project i’m working on. I wanted it plain, with no nuts or chocolate or other distractions. Just pure buttery sweet goodness. Of course, I couldn’t find that anywhere in the stores. So I thought for a second and remembered the time I made homemade caramels. They were so delicious, and a breeze to throw together. I have some basic knowledge of candy making, and I knew I could handle it. So instead, I grabbed a bag of sugar and some butter, excited to head home and get crafty in the kitchen. If you have never made your own candy, you really need to give it a try. It’s so much fun, and you can make it any way you want. Homemade is much tastier than anything you can buy in a package, and much cheaper. This recipe is so simple, it’s a perfect starting point for trying out candy making. I don’t work with candy thermometers. The easiest method for me is ice testing. Get a little bowl of ice water ready before you get started, and drip a little drop of candy in every so often so you can get to know the different stages of candy! 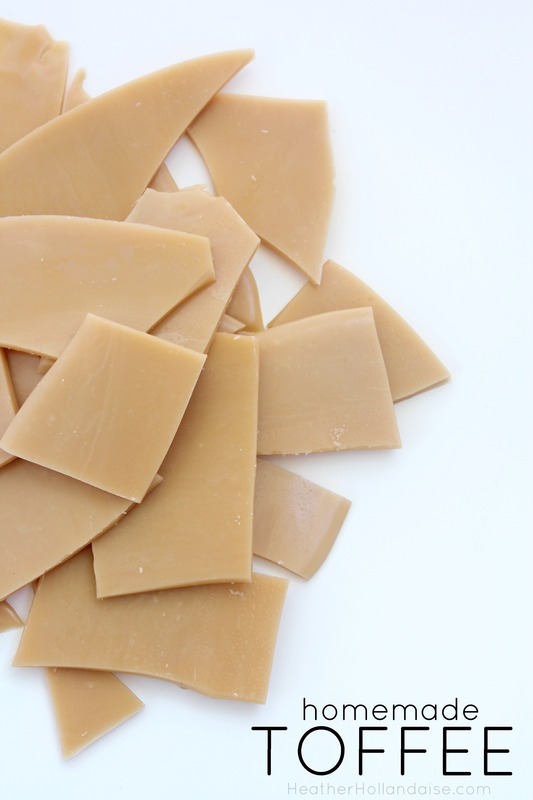 The toffee is done at a “hard crack” stage, when it hardens and can break after cooling. Fill a small bowl with ice water and set aside. Melt butter over medium heat in a large skillet. Add sugar, water, vanilla, and salt, stirring continously. Continue to cook and stir for about 15 minutes. Test a drop in the ice water and wait a few seconds. Candy should be hard but easy to break. Remove from heat and pour onto a baking sheet lined with parchment or silpat. Allow to cool completely. Place in the fridge or oven to cool quickly. If desired, add crushed toasted nuts to your baking sheet before pouring on the toffee, or sprinkle some chocolate chips on top, let them melt, and spread!